Good afternoon! 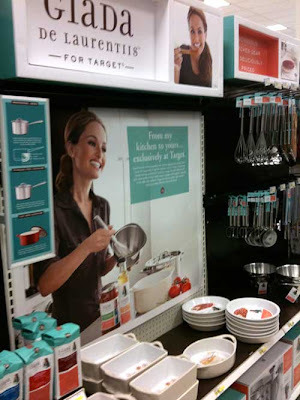 Okay, so my husband and I were at Target last weekend and I was looking all around the kitchen section and I saw this huge display of a new line by Giada De Laurentiis, it's mostly cookware, but there are a few items. One of the items was marinara sauce. I knew I had to try it, because if you've seen this girl cook, you KNOW she knows her Italian food. So her marinara HAS to be good, right? Click HERE for a link to see the whole line exclusively from Target. There were 3 different kinds of marinara, Tomato Basil, Vegetable Marinara and Creamy Tomato. We chose the Vegetable Marinara. The label says "made with tomatoes, fresh red bell peppers, fresh mushrooms, fresh onions and fresh carrots". We are SO glad we picked up a jar of this, because we both thought it was amazing! It tasted so fresh and delicious! If you live near a Target, or aren't opposed to ordering online, I would highly suggest doing so. At $2.99 a jar, it isn't that much more than, let's say..bertolli or any of the other "better" store bought marinara sauces. As one who doesn't like overly thin marinara, I found this one to be delightfully thick with noticeable pieces of mushrooms and red bell peppers. After I bought this I knew I wanted to make homemade meatballs to go with and make it a really nice pasta dinner, and that it was! Delizioso..four thumbs up from us Giada! In a large bowl, add your meat, onions, garlic, bread crumbs, parsley, eggs, Parmesan cheese and salt & pepper. Mix by hand until mixture comes together and everything is incorporated evenly. With your hands, grab some of the mixture and roll into golf ball size balls and set aside and repeat process until done. Coat meatballs in flour and shake of excess. In a skillet, heat oil on medium high heat and sear meatballs on all sides then remove to a plate (they will still be raw in the middle). Drain oil from skillet, but don't clean it out, you want all the bits that are at the bottom. Add your marinara and then place your meatballs in the sauce, and then use a spoon to completely cover them in the marinara. Cover the skillet and lower your heat to medium and let your meatballs finish cooking in the sauce for a good 20-25 minutes. Once ready, spoon the marinara with meatballs over spaghetti and if desired, sprinkle with additional Parmesan cheese and chopped parsley. I'm such a big Giada fan! This dish looks amazing thanks for posting! WOW!!!!! These look AMAZING! I'm new to your site...Somehow I stumbled across it a few days ago. But can I just say WOW!!! You have AALLLL delicious recipes on your site! I'm ready to go on a shopping spree and stay up all night COOKING! I especially can't WAIT to try these meatballs, the lasagna rollups and that parmesan encrusted chicken breast!! I agree with most here about the pictures- SOOO HELPFUL!! I've already bookmarked a few of your recipes. You should straight up have your own cooking show! WOW keep up the GOOD work, girlfriend! I'm INSPIRED! :) Sincerely, A friend anxiously awaiting your next recipe!